Discussion in 'UFOs, Aliens, Monsters, and the Paranormal' started by Curt Collins, Jan 13, 2019. A UFO report was recently made, accompanied by a 20-second phone camera video of a sighting in Canada. Jackhead, Manitoba, Jan. 11, 2019 at 3:00 pm. I've got a copy of the video, but couldn't figure out how to share it here. Apparently it's been posted on Facebook and has been sent to the media. I've included two screenshots of it. The camerawork is jerky, lots of pans and tilts. To my eye, there's no motion in the "object," which looks like a contrail illuminated by the sun (which is out of frame on the right). Is it a contrail - or maybe even just a cloud? Chris Rutkowski is looking into this, and he asked me to post it here, hoping that someone can identify it. Specifically, does this match a known aircraft's path found in FlightAware? To my eye, there's no motion in the "object,"
I see no motion. Looks like a contrail to me. how do you know it is 3pm? a sun analysis? I'm a bit confused because if the sun is SW wouldnt the object be south? Based on his knowledge of the area, he believes the fiery object was somewhere off to the northwest of Lake Winnipeg. It looks like contrail with a sundog. The object was going from the NW heading S."
If I had to guess I'd say this is the persistent smoke trail from a Quadrantid fireball. I think the observer saw the fireball but wasn't fast enough to catch it on camera. He videoed the persistent smoke trail. The blob at the far end is where the bolide blew up. There's no specific report of a fireball that matches this place and time, but there are numerous reports all over the Northern U.S. and Canada within 24 hours of this event. This could be an event that wasn't reported to the American Meteor Society site. Quadrantids aren't known for smoke trails, but no reason why there couldn't be one. i already edited your OP with that link. sorry, forget to notify you. unfortunately since the 'object' doesnt move in his video we have no idea what "progressed" means. There's no specific report of a fireball, but there are numerous reports all over the Northern U.S. and Canada within 24 hours of this event. Quadrantids aren't known for smoke trains, but no reason why there couldn't be one. The path of that fireball. Video of it, showing the speed. Still looks like a contrail with a sundog, to me. -I didn't point to that particular event. There were many events. -Are you sure what a fireball smoke trail looks like? This one from Arizona has evolved a complex shape because of winds. 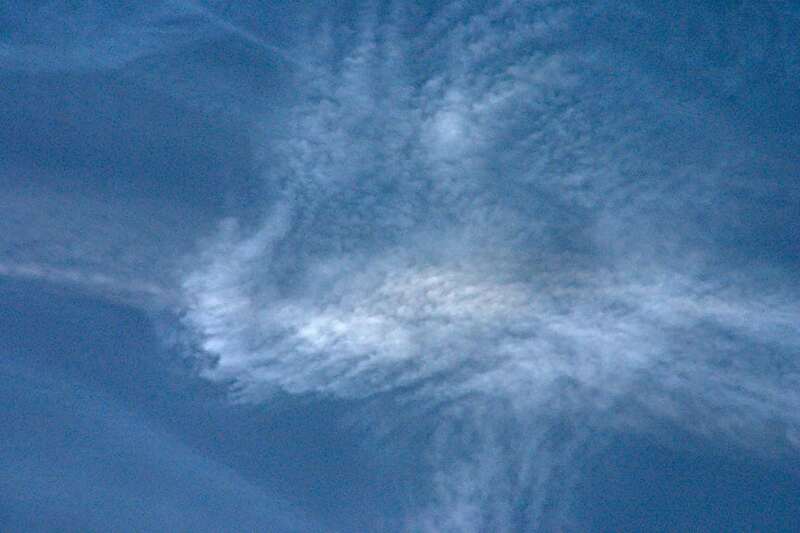 Over time, the smoke trail evolved into a more substantial outbreak of clouds. Why? Because of condensation around the small bits of dust in the trail. In effect it is a contrail. 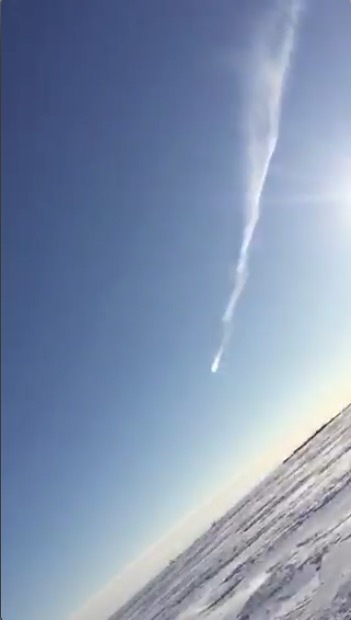 Video submitted to the Free Press shows an unknown object, blazing slowly through the sky above the frozen lake and leaving a smoky trail in its wake. That seems to be an inference made by the reporter. And this is an inference made by the guy who wasn't there, but got sent the clip. The 19-second clip was taken sometime Friday afternoon, said Henry Traverse, who lives in Jackhead, Man., on Kinonjeoshtegon First Nation reserve land. Traverse said his son Phil Traverse and granddaughter Kiasha shot the video and sent it to him while they were out fishing on the lake. "I don’t know if it was a meteor shower, or a meteorite falling, I don’t know," Traverse said. Could be just an ordinary contrail. But this sort of story - light moving across the sky leaving a trail - is usually generated by a plane and contrail illuminated in the twilight sky after local sunset. If the eyewitnesses saw a daylight fireball it would make sense. No way to tell though, so I think we've gone as far as we can with this one. The tough new privacy requirements set out in GDPR have, for the time being, made our site unavailable to non-subscribers in most European countries. So it does to me too. Thanks for your comments and suggestions. There's a new story out, much better than the first, and the answer seems to be contrail and sunlight. The phenomenon was most likely a perfect combination of atmosphere and sunlight, according to Scott Young, an astronomer and museum manager of the Manitoba planetarium. 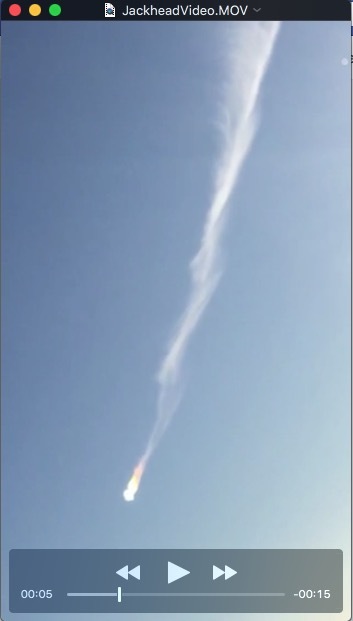 Young says sunlight was reflecting off a jet contrail, which is the cloud of steam that a plane leaves behind it. "The whole thing is all being backlit by the sun," he said. "It's really making the head of the contrail glow very, very brightly." Young says after studying the video, he can tell the bright ball of light is not a meteorite, asteroid, or anything else coming from outer space. "It almost looks like something that's frozen in time," he said. 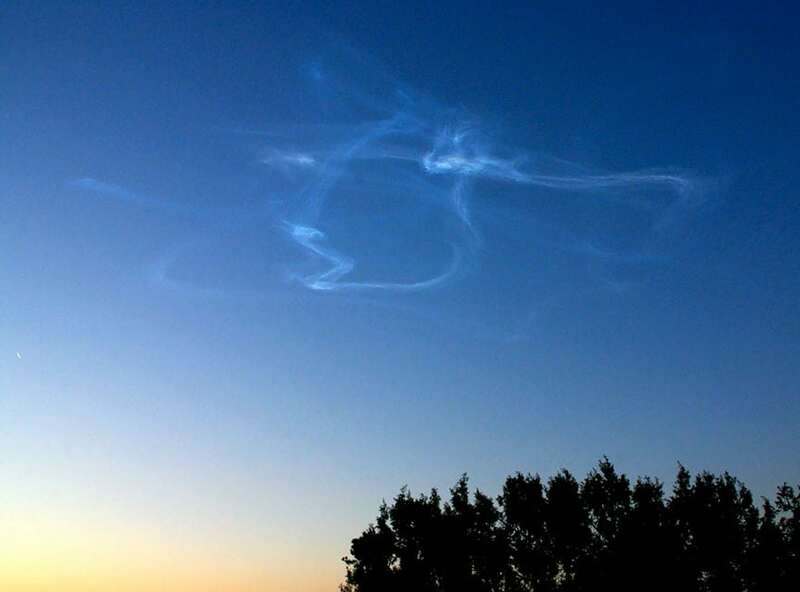 "Usually when we see a fireball or something burning up in the atmosphere, it's over and done within two or three seconds." "It's certainly not zooming at any kind of cosmic speed. So it was a little bit of a mystery it at first." 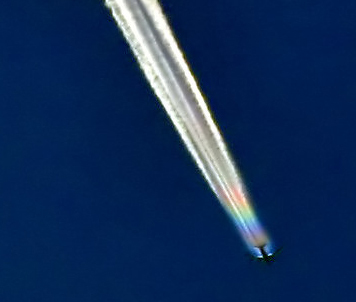 Young believes the jet might have changed direction away from the viewer and toward the sun, meaning the light coming through the contrail would become even more concentrated. "For some reason, there's that one spot of the cloud that seems to be very bright and concentrated. It's certainly an unusual contrail," he said. anyway, i caught the same thing. it was hard to get pics of because in my case the sun was right behind the contrail and was blinding me. bright end is below the window sash..
i was wondering why it hadn't made the UFO cycle yesterday.. guess it took them a while to find it. His enhanced pic doesnt look anything like a UFO. i see no "o". Here is a UFO caught a few days ago over Lake Winnipeg. The UFO is moving much too slowly to be a meteor from space and even too slow to be a jet. Oddly is seems to also have a fat head and yellow and orange back before the tail turns into a contrail. Of course someone tried to play it off as an illusion or trick of the sky. Its there, no tricks, its real. I also believe if the lake was fully investigated, someone will find a large round melted hole through which this UFO entered. This way it could enter an underwater base nearby. Waring. What a phony. He's a promoter, for sure! I've never seen a contrail like this one, but have seen lots of lingering fragments illuminated by the sun. The effect was that of a glowing streak hovering in the sky. I'm sure this was something similar. ive never noticed one either. but in your not zoomed still shot in the OP, it doesnt really look firebally so i'm sure i wouldn't notice such a thing in the sky. Cool pics (video) though. Glad she took it. A little better article from the CBC. I don't think it's a very good description of a contrail. Young said the clouds behind a jet are made out of little droplets of water. "So essentially a little drop of water is taking the light and bouncing it around, and acting kind of like a lightbulb with the sun shining into it, so it really gives us this radiant glow." As already suggested by @M Bornong, this looks very much like a sun dog on a spread out contrail/cirrus cloud. The coloured spot has the same elevation above the horizon as the Sun, and the order of rainbow colours is as expected for a sun dog. It should also be about 22° from the sun, which could be readily verified if the camera did not zoom in and out all the time. Iridescent contrail and a lens flare, not a sundog. What makes you think it's iridescence and not a sun dog? The iridescence in a contrail only a second or so in any one spot, it is also a different spectrum of colors. What we see in the OP is a sundog that coincidently lines up with the end of a contrail that a plane created earlier. So, it's a sundog that crosses a contrail? What an unbelievable coincidence, thanks for explanation! Happens all the time. I've seen a few myself. Thanks again Mick, I saw several sundogs but never something like that effect.